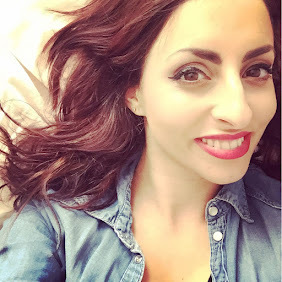 Hey lovelies!! So I thought about this long and hard and need your advice...do I carry on doing these posts or stop at 20?? Please comment!! Need your advice! As this is for you readers so you decide :). Anyway, back to business! 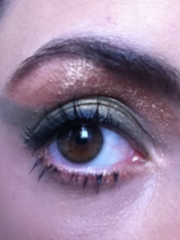 This look was a metallic green/bronze look, right up to the eyebrows like in the 80s! 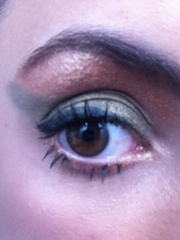 Firstly I used a Barry M shade of green, dont know the name as its rubbed off. 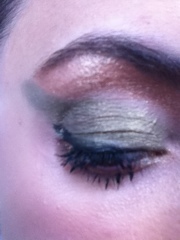 I then applied a metallic bronze from the Immaculate MUA palette! 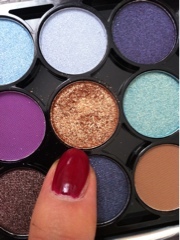 A fab shade that compliments many colours! Would look fab with purple or blue! 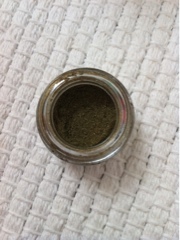 I also used this along my lower lash line to brighten my eyes. Mascara, gel liner and Benefit brow kit to complete the look! Hope you like it! Don't stop! :( Continue! Unless you don't have fun in doing the looks anymore, of course. I think this is a great way to express your creativity and to practice on doing makeup. Also, you inspire me to use more colour in my looks!